I’ve been running a number of articles recently on comic creators who have been unpaid on certain comic projects – and in some cases actually getting them paid. But I had one complaint recently from a creator who had not been paid for their work for Bluewater. They sent me the contract and then told me the publisher had told them the comic had not sold enough to warrant any payment. I have to say, on the basis of the contract they signed, they probably don’t have a leg to stand on, and no payment for their work is neccesary. Firstly, I’ve written comic books in the past that have had that kind of sales figure, and they still made a profit. But secondly, the contract they signed is basically open to whatever the publisher wishes to pay them. Take a look. This is that worst of all beasts, a back-end work-for-hire contract. 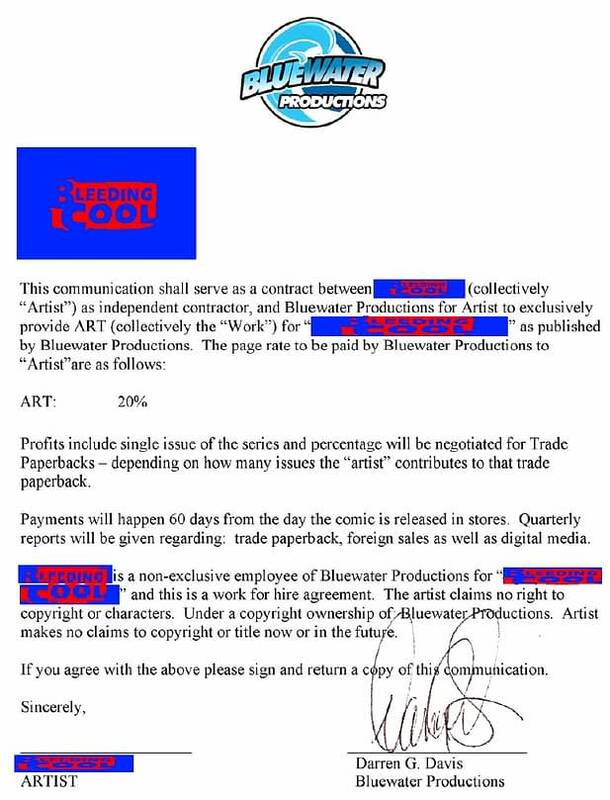 There should be some kind of rule here, if you create a comic work for hire, you should receive payment on submission and acceptance of the work. If it is creator-owned, then a back-end payment structure (clearly indicate what constitutes a profit, and then for the artist higher than 20% of that) is also acceptable. But this is the worst of both worlds. This is the contract that you only sign if you are happy for your work to be printed and not receive a cent. You’re in it for the exposure. And realise that this exposure may not hit 2000 copies and you could probably get more exposure with your own web comic. Which you own. current business model of profit-sharing with a variety of talented creatives. And I remain resolute that Bluewater is, and shall continue to be, a reputable business that operates with integrity.